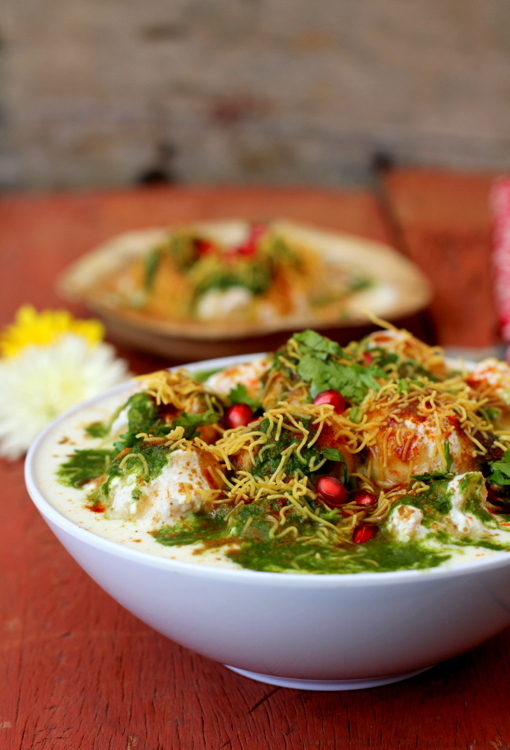 For our Holi brunch, I had prepared Delhi style Dahi Bhalla chaat and it literally transported me to heaven. Love, love dahi bhalla! 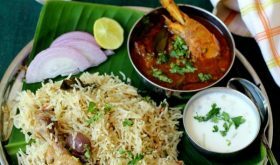 The flavors of Indian street food are mesmerizingly addictive and very hard to resist. 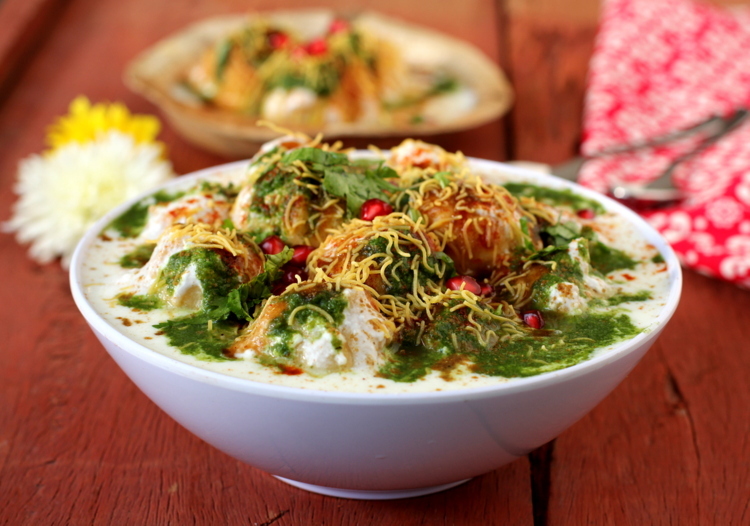 One bite into a dahi bhalla and you will experience an explosion of a diversity of flavors in your mouth. Its undescribable! 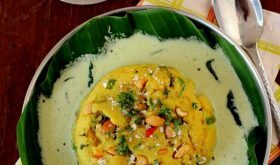 Down South, we make Perugu Garelu (Andhra) and Thayir Vada (Tamil Nadu) where the vadas are soaked in beaten curd and tempered with mustard seeds and curry leaves while the North Indian Dahi Vada and Dahi Bhalla are topped with a colorful array of delicious contrasting flavored chutneys, spice powders and garnishes like sev. 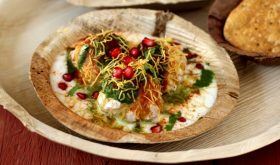 The yogurt for Dahi Bhalla is thick, creamy, chilled and sweetened with sugar and poured over the soft vadas. At the time of serving, green chutney and sweet chutney are spooned over them followed by a generous sprinkling of roasted cumin powder, red chili powder, chaat masala, black salt, sev, coriander leaves and finally finished with off with a colorful sprinkle of pink pomegrante seeds. Grind the urad dal, moong dal, green chilies, ginger and salt together to a fine pase. Add very very little cold water while grinding. (approx 2-3 tbsps). Remove to a wide bowl. 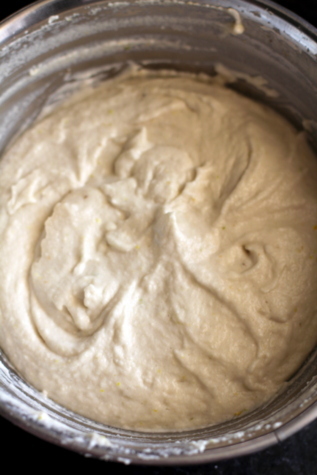 Using your hand or hand beater, beat the batter for a good 5 mts till it is airy and light. 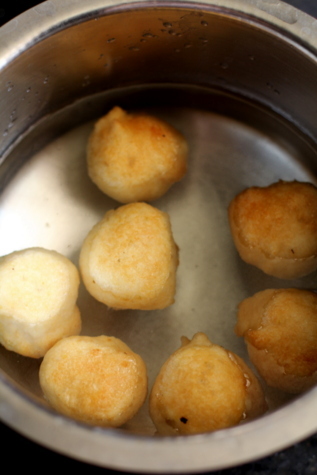 Pre-heat oil in a deep frying vessel, slowly drop large lemon sized quantity of batter into the hot oil. Deep fry on medium heat for sometime and then fry on high heat till golden brown. 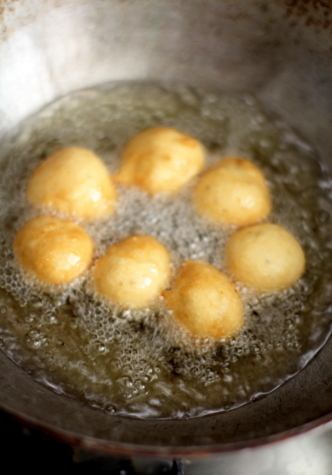 Remove these deep fried vadas into a bowl of luke warm water and place them in it for a mt. Remove and gently press between your palms so that excess water oozes out. Keep them aside. Beat curd well till smooth and add the water as required, 1/4 tsp red chilli pwd and 1/4 tsp cumin pwd and salt to taste. 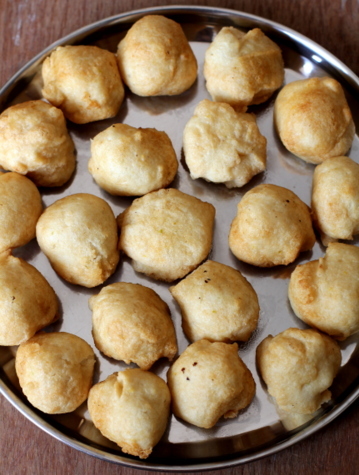 Chill the vadas for sometime before serving. At the time of serving, take 2-3 vadas and place them in a serving plate, pour 2 tbsps of green chutney followed by 2 tbsps of sweet imli chutney, sprinkle some chaat powder, roasted cumin powder and and garnish with sev, fresh coriander leaves and pomegranate seeds. 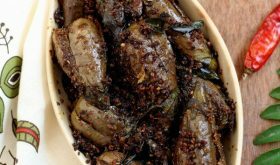 You can sprinkle some black salt too over the dahi bhalla. By Sailu Published: March 22, 2014 Dahi Bhalla recipe is almost the same as how you make Dahi vada. Adding sugar to beaten curd while making Delhi style Dahi Bhalla Chaat is the difference. the pictures are drool worthy. I’m something of a chaat-fanatic. can’t get enough of it & your recipe looks great. Wow dahi bhale. I miss this Indian street food in canada. I am drooling over my keyboard. 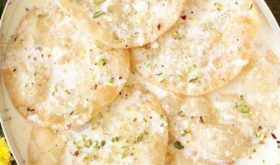 its not dahi bhalla its dahi bada…..
Hello, when do you use the powdered sugar? I gotta say North Indian street Food Beats South Indian ones.. while South Indians have better variety of Sweets North Indian snacks beat the South Indian ones by a LONG mile…. 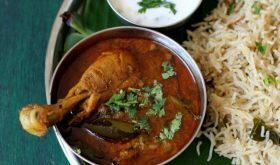 especially because they mix up sour,salty&spicy whereas South Indian snacks alternate between either spicy or sweet.